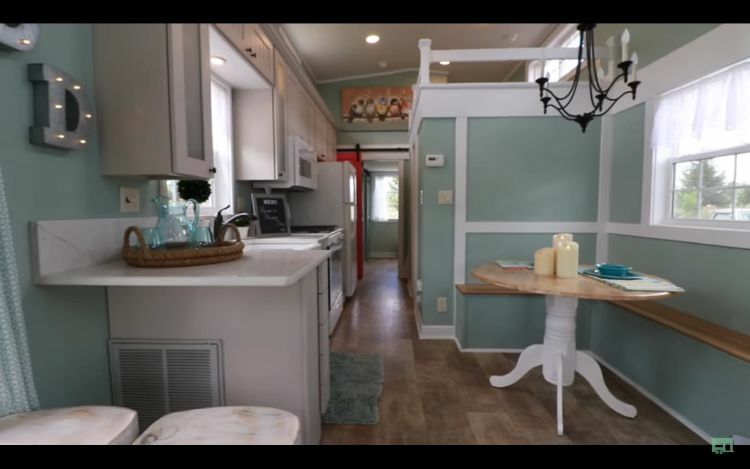 Dee Dee is not your usual park model tiny home. Measuring 37 feet long and 11 1/2 feet wide, the first floor alone has a total area of 400 square meters. It has a second floor, which can be used for a variety of purposes such as an extra room or additional storage space. 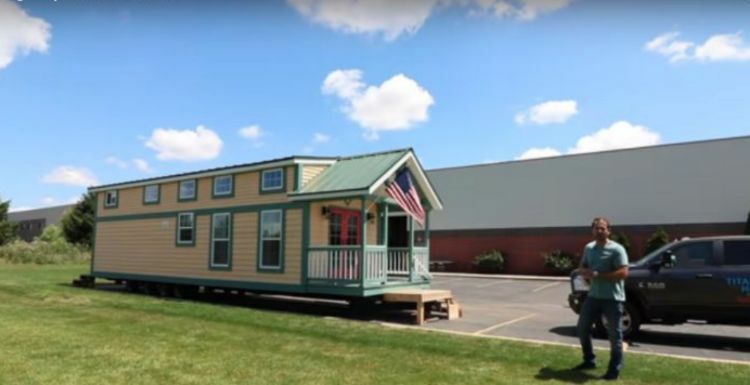 Designed and conceptualized by Bantam Built, a tiny house company based in Elgin, Illinois, the fully equipped home is priced at $95,000. A client was so impressed with Dee Dee that she traveled halfway across the world to her new home. From its original location in Illinois, the client brought Dee Dee all the way to Maryland. Her next stop was Madrid, and then finally she reached her ultimate destination in Switzerland. 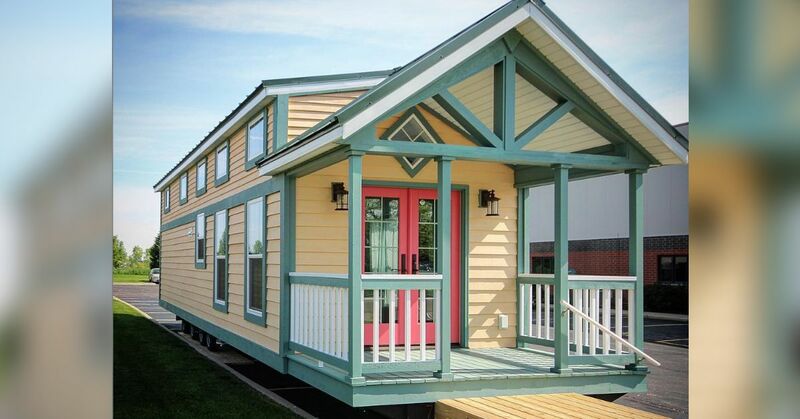 Dee Dee’s bright candy colors make her stand out from all other tiny homes. It will surely lift up your spirits and put a smile on your face the first time you see it. Its exterior is made from real cedar sidings, which were painted a creamy yellow color, complemented by the green color of the window frames, porch trim and metal roof. Several double thermal insulated glass windows throughout the home ensure that the house is energy efficient. The sturdy metal roof protects this home from the natural elements. 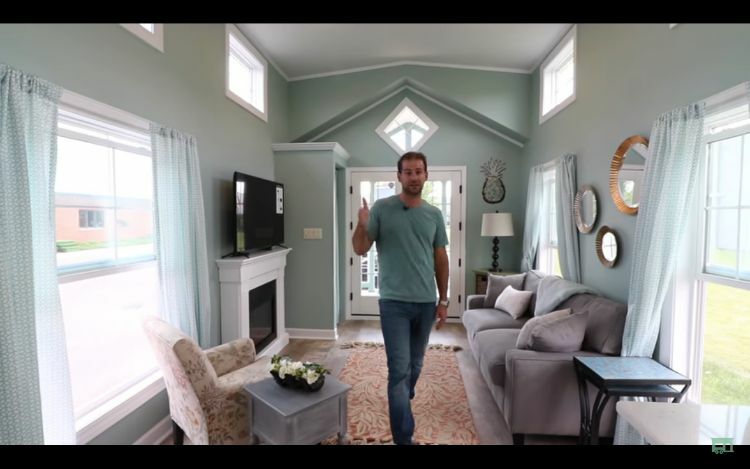 As you step onto the home, the very first thing that you will notice is the spacious porch. This space can fit a couple of chairs as well as a small table. Or if you prefer, you can put a pair of rocking chairs for that traditional porch look reminiscent of less stressful times when folks could let hours slip by, simply sitting and doing nothing. A couple of porch lights ensure that you have enough light to keep you company at night while the brightly painted watermelon pink-framed French doors welcome you into the home. This living room has a lot of seating options. Take your pick. You can choose to relax in the pale ash gray colored love seat where you will find several throw pillows as well as a light blanket. You can watch television while enjoying the soft warmth from the fireplace. Or you might prefer to sit and read your favorite book on the cozy armchair covered in floral-printed upholstery, which is located across the love seat. You can even sit on the floor right on the pale peach patterned area rug if you feel like it. The soft green sheer curtains on the windows complement the green color of the walls. The predominantly white kitchen is fully equipped with a stove, microwave, and a large refrigerator. Several built-in cabinets are found above the appliances. The full-sized cast iron farmhouse sink is an impressive feature of this tiny home. Right across the kitchen area is the dining area with a small round table. You can either sit on the built-in bench against the wall, or you can put regular chairs on the other side of the table and sit on those instead. You will surely get a good night rest in this cozy bedroom where a queen-sized bed fits perfectly. Having several pillows on the bed makes the room even more inviting. 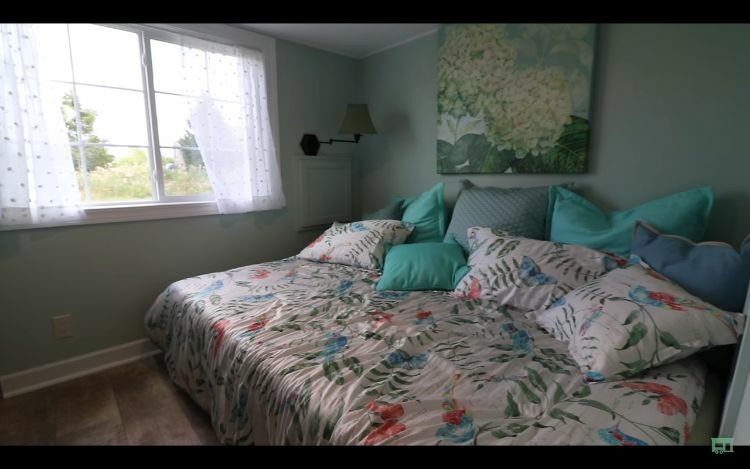 Hanging a floral themed art piece on the wall behind the bed adds depth and a nice visual interest to the space. The windows on one side of the room allow just enough sunlight for those days that you want a little bit more light in the room. The bathroom in this home is just like a typical bathroom in any other regular-sized house. 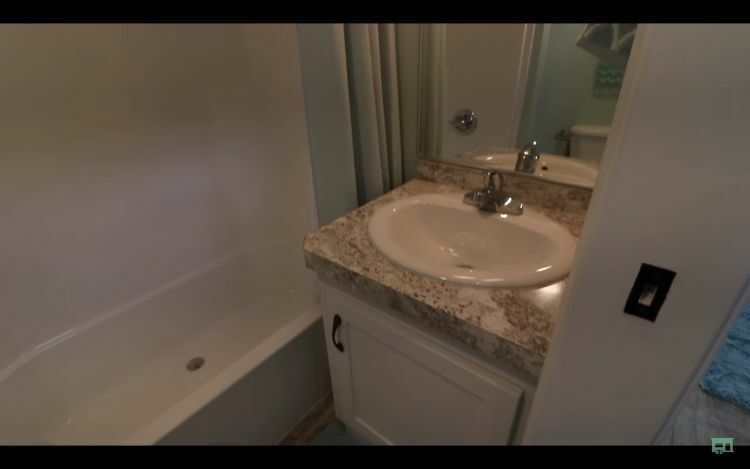 You won’t feel cramped at all as it has a full-sized shower and bath. The toilet is just like any other toilet that you will find in most homes. There’s a vanity plus ample storage area that is available for all your bathroom essentials. You can have guests over as the loft can accommodate more people inside the home. The space has two distinct areas where the first section can fit a twin-sized bed, while second section, which is bigger, can fit a king-sized bed. Alternatively, if you don’t want to use this space as bedrooms, you can use it as an extra storage area for your things. The team gets Dee Dee ready to be shipped to her new home in Switzerland.